Phobos is one of two very small satellites of the planet Mars. It was discovered along with its smaller companion, Deimos, by Asaph Hall at the Naval Observatory in Washington DC in August 1877. The moons are named after the children of the Greek god Ares - who, like the Roman Mars, is the god of war. Deimos means 'terror' or 'panic' and Phobos means 'fear'. Phobos has an equatorial orbit, which is almost circular. It orbits once every 7 hours 39 minutes just 5989 km above the surface of Mars. Its orbit is decaying by 1.8 cm per year, so it is expected to crash into Mars, or break up to leave a ring of fragments around the planet, within 100 million years. The orbital period of Phobos is three times faster than the rotation period of Mars, with the unusual result among natural satellites that Phobos rises in the west and sets in the east as seen from Mars. It orbits so close to the surface of Mars that the curvature of the planet would obscure its view from an observer standing in Mars' polar regions. Phobos is too light for gravity to make it spherical. It has a very lumpy appearance, and is heavily cratered. In 1988, the Soviet spacecraft Phobos 2, detected outgassing from the satellite, but could not ascertain its nature because of a malfunction, during which a planned lander was also lost. Observations by the Mars Global Surveyor revealed that the surface is covered in dust at least one metre thick, suggesting erosion due to meteor bombardment. The dominant feature on Phobos is a relatively large impact crater (diameter about 9.5 km), named Stickney, which was the maiden name of Asaph Hall's wife. Numerous secondary craters were probably formed as the result of the impact which created Stickney, which means crater count is an inaccurate chronometer for Phobos. Radiating from Stickney are large grooves which may indicate the force of the impact. However, other grooves on the central portion of the moon run almost parallel and it is suggested that they may have been created by ejecta from impacts on the Martian surface below. Phobos may have a dust torus, but evidence for this has so far been indirect. The origin of Phobos is being studied in detail but remains unclear. 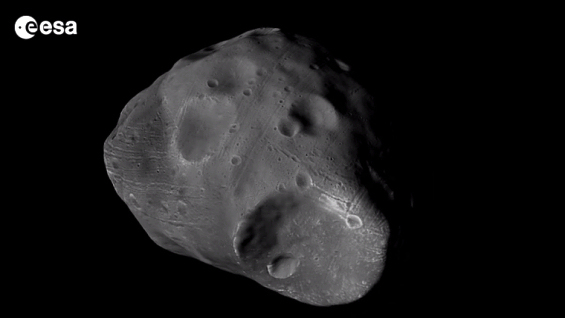 One idea is that Phobos is a captured asteroid. Data returned by the infrared mapping spectrometer experiment on board the Phobos 2 mission supported this view, but more recent investigations of its composition, including research with data provided from fly-bys by Mars Express, suggest that other processes may have been responsible. One reason to suspect that Phobos is not a captured asteroid is its density. Analysis of Mars Express radio science data gave new information about the mass of Phobos based on the gravitational attraction it exerts on the spacecraft. The team concluded that Phobos is likely to contain large voids, which makes it less likely to be a captured asteroid. Its composition and structural strength seem to be inconsistent with the capture scenario. It is possible that Phobos formed in situ at Mars, from ejecta from impacts on the Martian surface, or from the remnants of a previous moon which had formed from the Martian accretion disc and subsequently collided with a body from the asteroid belt. Data from the Mars Express OMEGA spectrometer suggests Phobos has a primitive composition, so primitive materials must have been available for accretion during its formation. The circular orbit suggests that Phobos formed in situ whilst analysis of the Planetary Fourier Spectrometer data from Mars Express also points towards in situ formation but does not rule out the possibility that Phobos is a captured achondrite-like meteor. Further information about the orbit, shape, rotation and interior structure of Phobos would have been gathered by the Phobos-Soil mission, which failed to leave Earth orbit following launch in 2011. Understanding the formation of the Martian moons would contribute to the overall understanding of the formation of the Solar System, and scientists from ESA are considering a future sample return mission to Phobos.